What is known today as the Mozartplatz Square in the heart of the old town of Salzburg just next to the Neue Residenz, was opened Prince Archbishop Wolf Dietrich von Raitenau ordered to destruct a number of houses on this site in the early 17th century. 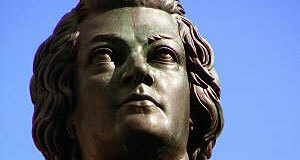 The central piece on interest is the Mozart memorial by Ludwig Schwanthaler. It was opened in 1842, a difficult time for Salzburg then secularised only two decades earlier and still suffering from the devastations of the Napoleonic wars. The two sons of Mozart were present at the opening of the memorial, Mozart′s widow Constanze von Nissen had died half a year earlier in May 1842 in a house on the Mozartplatz. There were some arguments on which square to name after Mozart - the "Hannibalplatz" in front of the Dreifaltigkeitskirche (Trinity Church, today "Markartplatz"), or the current Mozartplatz, then known as "Michaelsplatz". There was a Baroque fountain with a statue of St. Michael in the centre of the Square, which faced the Michaelskirche church. It had to be removed for the Mozart memorial, an expensive enterprise for the economically distressed city of Salzburg. It was the mentally disturbed King of Bavaria, Ludwig I., who was passionately in love with Salzburg and adored Mozart (he even lived in Schloss Leopoldskron Castle after he had been forced to resign in 1848), who donated a significant amount of money to start the erection of the memorial. The opening had been planned for 1841, but then construction workers discovered a Roman mosaic under the Baroque fountain and the work got delayed. The mosaic is visible next to the marble base of the memorial and bears an inscription: "hic habitat (felicitas), nihil intret mali", meaning "Here lives (the luck or happiness), nothing evil might enter". Nearby in the "Schaffner-Haus" on Waagplatz Square, you will find the Trakl Gedenkstätte (Trakl office). It is the birthplace of the expressionist poet Georg Trakl.